I recently hauled some lipsticks and nail paints and ever since I got them, I have been planning to do their swatches. So today I’ll be doing the swatches of new Streetwear Color Rich Ultra Moist Lipsticks which has become talk of the beauty block due to their affordability, cute packaging and funky shades! Texture: The texture of the lipsticks is soft and creamy which settles to a semi matte finish with little bit of sheen. Pigmentation: Streetwear lipsticks are decently pigmented, most of the lipsticks gives a decent color pay off with 2-3 swipes while some need extra swipes to get a good color pay off. The lipsticks stay for 2-3 hours without tugging or pulling which is decent considering the price you get them at! Crisp Caramel: A light peachy n*de great for everyday wear. Pink Persuasion: Pretty pink which flatters my complexion. This is my favorite of all shades. Riveting Rouge: The most pigmented lipstick of this range! It’s a bright tomato red which would suit fair skin complexion. Ruby Riddle: A peachy brown shade great for everyday/office wear. 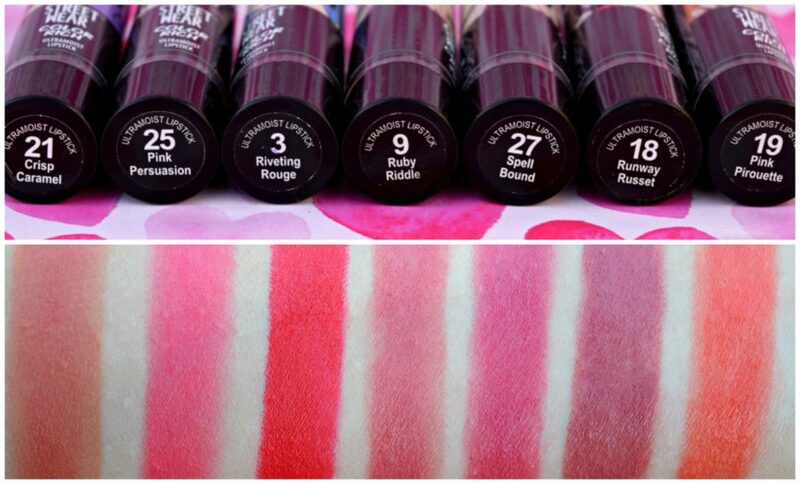 Spell Bound: A pink shade with brown undertones, will suit mostly all skin tones. Runway Russet: A light brick brown which would suit all complexions. Pink Pirouette: Bright orange which you can wear as a natural shade with one swipe and as bright fresh orange with 3-4 swipes. Nothing pink about it except its name! I’ll be doing separate detailed reviews on these lipsticks in my coming posts!! 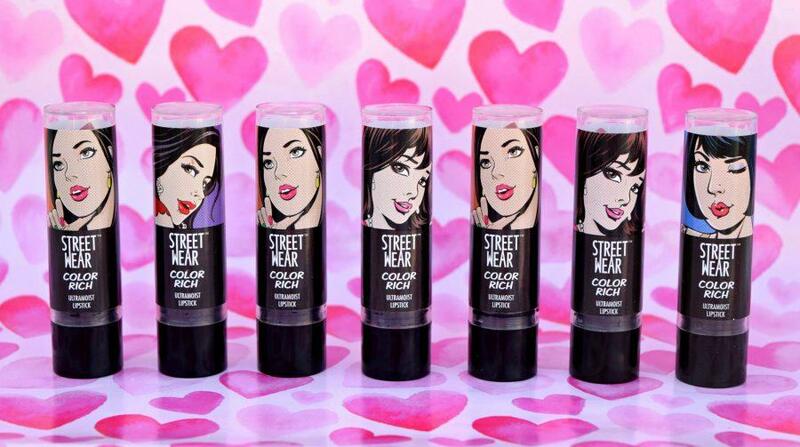 Which is your favorite shade from this range? And which shade you want me to review first? Wow . Great shades. Can’t wait for the reviews . I really like the Crisp Caramel one. Yup the packaging is cute and girly and this is what tempts to buy these lippies. Pigmentation is superb for the price. Loved ur pics! They are all very wearable shades !! Loved your pictures!! i so love these lippies… i hv no idea y u didnt pick up very vampire cuzu love reds ryt? These look amazing! Love all the shades, but a few are too similar to each other! 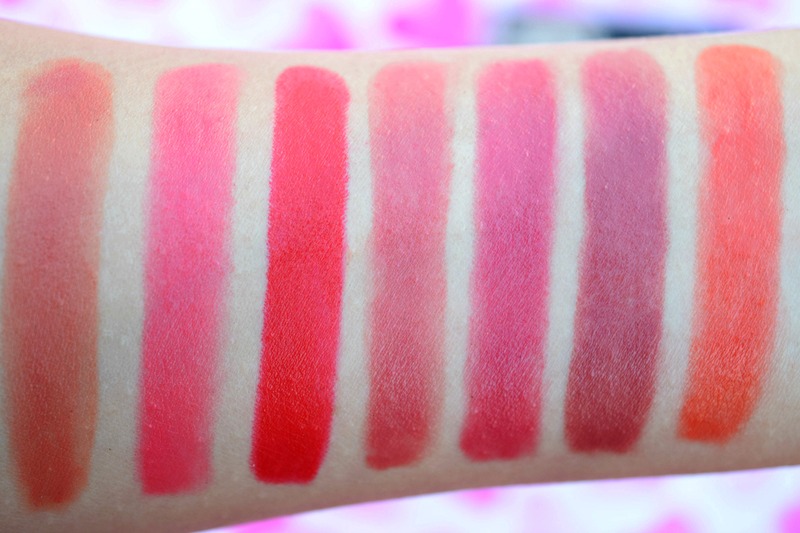 Lovely swatches.. U tempt me to get them..:p.. So.. Which of this will suit a bit dusky complexion.? ?